We have been fortunate to have so many wonderful people supporting our efforts. Thank you for attending and your continued support. I have enjoyed helping people turn their lives around. FleaHab would love to expand to eventually open a women’s SLE in Santa Cruz. This can only happen with your support. Thank you for your support in coming to our Solstice Dinner fundraiser. 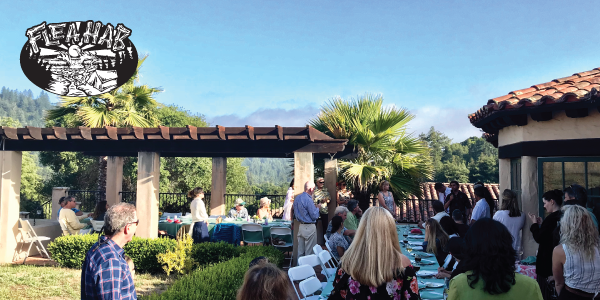 Casa Toyon provided a lovely setting as we enjoyed a meal of fresh salmon, tri-tip and strawberry desserts. Beyond the food, hearing from those members of FleaHab who have benefited from your support gave a testimonial to how valuable and needed programs that help overcome addiction are. Your contribution to this cause has far-reaching impacts and is an invaluable investment in the lives of individuals, their families, and our community as a whole. June 7, 2014. FleaHab hosted its 3rd Annual Golf Tournament at the beautiful DeLaveaga Golf Course in Santa Cruz. A great time was had by all, and we raised over $3,600 for our FleaHab sober living environment! Guest Mark Taylor was chosen to try for the $10,000 putt, but alas did not make it. Our events would not happen without the generous support of our sponsors: Central Coast Drilling, Grau-Sunset Realty, Taylor Built Construction, Studio 831, O’Neill, and Bay Federal Credit Union. Many thanks to our golfers, donators, and sponsors! August 31, 2013. Thanks to everyone who attended the FleaHab Labor Day Luau! It was a big success with close to 20K raised for our house opening in February! We would especially like to thank Jim Hogan, Heart of Technology, and our sponsors: Atrenta, Ow Properties, ChipEstimate.TV, Mod Marketing, Dr. Jay Pruzansky, Pearson Arrow, Aloha Island Grille, and Extra Large. We appreciate your support in helping people beat addiction to live happy, healthy, and productive lives!